"Share great products with your friends, family and colleagues that you know they’ll love." FlickUp helps you tell anybody human, or exceedingly clever dogs, about that delicious new food or drink product they need in their life. What’s more you can see the product you received on FlickUp whenever it suits you. "Buy delicious products directly through the FlickUp app and receive them at your door." 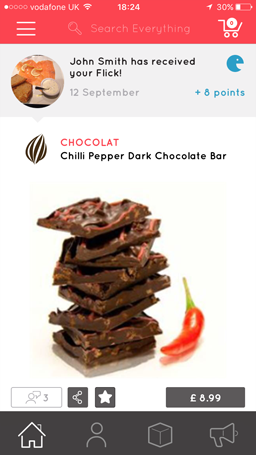 On FlickUp you can buy food & drink products directly on the app and receive them at home. Just like Amazon. However, with FlickUp you’re buying directly from trusted & specialised merchants that we have partnered with. They receive your order, they send it to you, no fuss, no middle man. "Simply share gourmet products with your friends, family and colleagues and wait for them to buy." 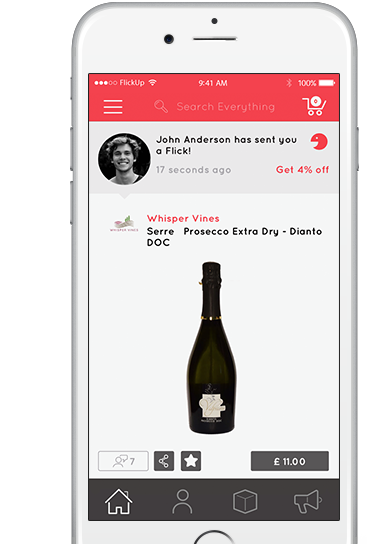 FlickUp rewards you with points every time you share your favourite food & drink products. But hold up, these points are actually useful! You can use your FlickUp points to get your favourite products, for nothing. Seriously. FlickUp has plenty of features to help get you sharing those products fast. "I love using FlickUp to discover new wines that my friends have recommended! Plus I use the points I earn to buy some of them for free!" " FlickUp is great! I’ll never forget my friends’ suggestions again, plus when I do buy, they get points, we all win! " "I’ve been using FlickUp with my friends & it’s loads of fun! We can’t wait to see more products soon!" Can’t see your question? Just head to the contact us section and get in touch! We like to think of FlickUp as a platform for you to tell people about products you're excited about. With FlickUp you can share your favourite products and get rewarded when your friends or family buy them. We curate the products and merchants that are on the app and ensure that everything works smoothly. All orders are sent direct to our reputable merchants as soon as you buy something on FlickUp. FlickUp is free for you to download and use on your device. You only pay for products you buy. Simple. For the moment FlickUp is only available in the UK. However we’re looking to take it to new countries soon, so keep checking and we’ll keep you up-to-date. Otherwise follow us on Twitter or Facebook for all the latest news. What devices can I use FlickUp on? Currently you can download the app on Apple iOS devices (e.g. iPhone, iPod, iPad etc.). But never fear, we’re working on a shiny, new Android app too! So follow us on social media and we’ll keep you up to date on our progress. It couldn’t be easier: you receive FlickUp points when someone you have recommended (Flicked) a product to, buys the product. As soon as they have bought the product, you will receive points. When you have enough points, you can use them to buy whatever delicious product strikes your fancy on our App, without paying a penny. See? Easy! What kind of products can I find on FlickUp? Good question. 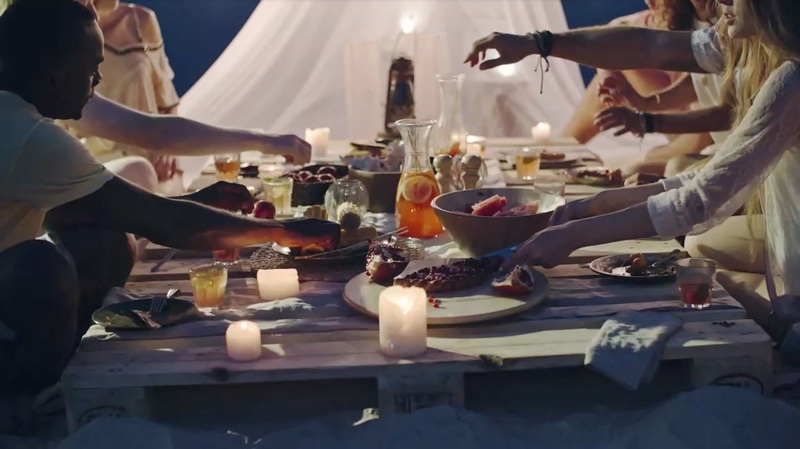 We focus on food and drinks products, because lets be honest, who doesn't love eating and drinking? We’re constantly working hard to expand our range of merchants here at FlickUp, meaning new products for you to share with your friends and family. If there’s something you would like to see please get in touch and we’ll do our best to get a merchant with the product on board the app! We have some strange words floating around the app, but fear not, they’re just descriptive! A Flick simply means a product that has been shared, i.e. sent to a friend or family member. We call it a Flick because that’s the action you use to send a product in the app. Is it safe to buy on FlickUp? We do not share any information with third parties. Ever. The only information sent to the relevant party is of course the orders you place, these are sent only to the relevant merchant so they can send you your items. We also do not keep any payment information at all, all payments are secured through PayPal, one of the world’s most trusted online payment systems. What payment system is used on FlickUp? We use PayPal as our payment system due to their high standards of security. we’re a nice bunch, send us a message below and we’ll answer any questions you have. ©FlickUp SA 2018. All rights reserved.